The City Hall of the Shimsk municipal district, the Novgorod Region, authorised Yabloko’s rally against healthcare optimisation and the closure of the local hospital. The protest action will take place on 26th January. Yabloko Chair Emilia Slabunova will make a speech at the rally. According to Chair of the regional party branch Anna Cherepanova, the participants of the demonstration will protect the constitutional rights of people to have health protection. They will demand that the regional government cancel the design to close the twenty-four-hour in-patient department of the Shimsk central hospital. 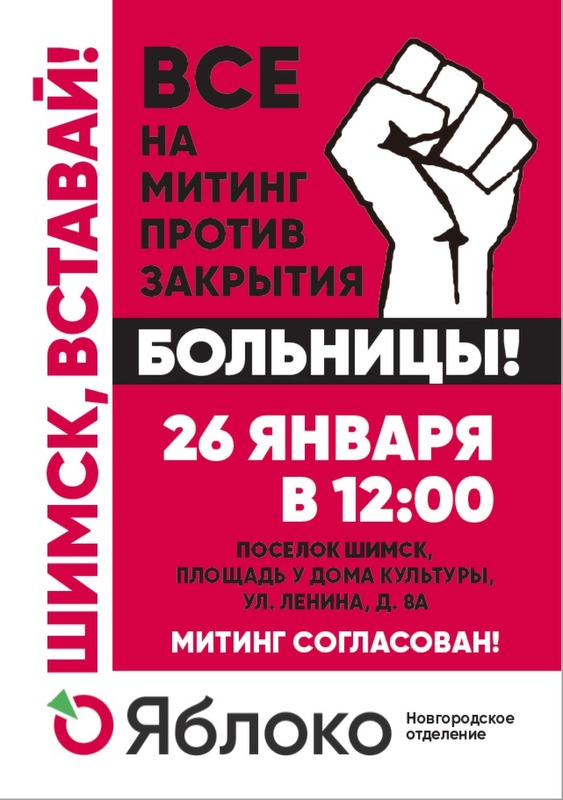 What is more, the protesters will express their disagreement with the policy of the Governor Andrei Nikitin, his administration and demand that Antonina Savoluk, regional Healthcare Minister, resign. Anna Cherepanova believes that the closure of the department will affect 12,000 people who live in the district. This decision constricts the declared policy of the government to improve life expectance and decrease the mortality rate. According to official data, the Novgorod Region has one of the highest mortality rates in the country in 2017 (the number of deaths per 100,000 people is 1712,2). Experts say this is due to the lack of places in in-patient departments as well as the decline in the ambulance service. Over the period of 2012-2017 the number of hospitals in the Novgorod Region decreased by 12 per cent (from 42 to 37), the number of beds in hospitals decreased by 20 per cent (from 6173 to 4962). As of 1st January 2018 hospitals are in need of 160 doctors. As of the end of 2017, 38,8 per cent of building that belong to hospitals require urgent repair works.